SK Brothers Realty general manager Chan Ai Cheng (inset) says if one wants to buy a house, one first needs to figure out how much he can afford. BUYING a house for the first time is like getting married. You need to be level headed, think wisely, plan well and eliminate the chances of regretting the decision later. For first-time house buyers, scouring the market for a suitable property can be exhilarating but it can also be frustrating if you don’t find “the one” or you do but it comes with a bust-your-budget price tag. There are a few factors to consider in the pursuit of buying your first dream house. Firstly, a prospective house buyer should ascertain how much upfront money he or she can fork out, says SK Brothers Realty Sdn Bhd general manager Chan Ai Cheng. “This is important. There are heavy upfront costs depending on what you buy, including transfer cost, legal fees and so forth,” she says. Secondly, the prospective buyer needs to check with the bank on the amount of loan that can be secured based on the income level. “At the same time, try to have savings amounting to at least three to six months of loan instalments plus household expenses as reserve fund, in case of an emergency,” Chan says. In short, if you want to buy a house, you need to figure out your affordability – how much you can afford. A real estate agent tells StarBizWeek that the rule of thumb is that monthly loan repayments should not exceed one third of the gross monthly income. “In assessing your repayment capability, the financial institution would also take into account your other debt repayments such as car loan, personal loan and credit cards,” he says. He adds that the margin of financing can go as high as 95%. “The higher the margin, the higher you will have to pay per instalment. Plus, at a given rate, a shorter tenure will require you to pay higher instalment,” he says. He adds that after you have set your finances right, make a list of features you are looking for in a house. “Be sure that the house you are buying is big enough to meet all your future needs, in case you have additional members in the family,” he says. “Take good note of the area and the neighbourhood as these aspects will play a crucial role in determining the price of the house in case you want to sell it in future,” he adds. In terms of financing, buyers have a wide array to choose from be it conventional or Islamic. Under the conventional financing, one’s outstanding loan consists of principal plus the interest charged. “The interest is actually the financial institution’s cost in obtaining the funds. Islamic financing works on the concept of buying and selling where the financial institution purchases the property and subsequently sells it to you above the purchase price,” says a banker. As for the loan tenure, it can range from anything up to 30 years or until the borrower reaches the age of 65, whichever is earlier. She also advises that it’s better to buy than to rent a home as the latter is largely expense without equity. Still, the key determinant ought to always be keeping within the budget. “That’s most important. It’s easy to be swayed into wanting a bigger home or a bungalow just because your friends or someone else has one. This is nice to wish for but definitely not practical if it’s way out of your budget. Be realistic,” the banker says. Ask on the “right” timing to buy a house, she says there is no “right” time to buy or sell anymore. “If you find a home now, don’t try to second-guess the interest rates or the housing market by waiting. Changes do not usually occur fast enough to make that much difference in price and a good home will not stay on the market long,” she says. PETALING JAYA: To promote home ownership among Malaysians, the Government has proposed to introduce First Home Scheme whereby Cagamas Bhd will provide a guarantee on the 10% down-payment for houses priced below RM220,000. The scheme is for first-time house buyers with monthly household income of less than RM3,000. It is aimed at young adults who have just joined the workforce. With the guarantee from the national mortgage corporation, it means that eligible house buyers will be able to obtain a 100% loan. First-time house buyers will also be given stamp duty exemption of 50% on instruments of transfer on a house priced at not more than RM350,000. The Government has also proposed stamp duty exemption of 50% be given on loan agreement instruments to finance such first-time purchase of houses. To expedite the process of property registration, the Stamp Act 1949 had been amended to enable the Valuation and Property Services Department assess properties after the payment of stamp duty to the Inland Revenue Board. This will reduce the property registration process from 30 days to one day. The 50% stamp duty exemption for houses below RM350,000 covers an estimated additional 10% of the market, and together the incentives benefit all-in-all roughly 87% of housing transactions throughout the country. While Rehda views the measure as a very positive step towards closing the income gap, it acknowledges that properties which are found within these price brackets are not easily found in Greater KL or Penang due to higher land and construction costs in these vicinities. Concurring with Rehda, C H Williams Talhar & Wong Sdn Bhd managing director Foo Gee Jen expects the First Home Scheme to have a lesser impact on the Kuala Lumpur market as the prices of most houses here exceeded the ceiling set by the budget. “There will be more significant impact on housing demand in other cities such as Johor Baru, Malacca, Ipoh, and Kuantan,” he noted. Reapfield Properties Sdn Bhd managing director David Ong said the Government’s “invisible hand” in steering the housing market was important in the light of the current market conditions. “The Government is wielding its influence on two fronts – to help first time buyers and to signal to developers that a certain type of housing within a certain price range is needed. Developers can probably consider townhouses or condominiums within a certain price range,” Ong said. Ong said hopefully, with this move, developers would build houses within this pricing category. “The perimeters set out in the budget are correct. This is the type of house this group will be able to afford. They will need this kind of assistance,” he said. The move, he said, did not mean that the Government was not considering raising the downpayment for house purchase to 20% or 30%. “That may still come later on as increasing the percentage of downpayment does not fall within the budget,” Fernandez said. Ireka Development Management Sdn Bhd chief operating officer Lim Ech Chan said the First Home Scheme would enable first-time buyers to afford their first home and promote a healthy property market overall, encouraging more affordable housing to be made available. On the development of the 1,072ha Malaysian Rubber Board land in Sungai Buloh by the Employees Provident Fund, Poh said most developers were looking forward to the finalisation of the master plan and the granting of conversion and planning approval from the state. “The land area comprises both freehold and leasehold lands and needless to say, developers would want to see how they could position themselves and participate in the roll-out of this massive development,” he added. The mixed development comprising affordable houses as well as commercial, industrial and infrastructure facilities, is estimated at RM10bil and is expected to be completed by 2025. FIRST-TIME house buyers with a family income of less than RM3,000 per month need not pay the 10% down payment under the My First House Scheme (Skim Rumah Pertamaku). The 10% down payment will be guaranteed by Cagamas Bhd for houses priced below RM220,000. This will allow the first-time buyers to obtain 100% loan. They will also be given stamp duty exemption of 50% on instruments of transfer on a house not exceeding RM350,000. The Government also proposed a stamp duty exemption of 50% for loan agreement instruments to finance first-time purchasers. There will also be a housing assistance programme with an allocation of RM300mil for the construction and repair of some 12,000 houses nationwide – particularly in Sabah and Sarawak. Fomca secretary-general Muhammad Sha’ani Abdullah said these moves would help first-time purchasers get housing loans, but failed to tackle the core issue of house prices which had skyrocketed. “A first-time buyer may get the loan to buy a house, but it may not be the type of house he wants because prices are just too high,” he said. He added that the Government should set specifications and standards for houses under the RM220,000 price range. “A house can be priced at RM220,000, but the specifications and the quality of the house may not be much better than a low-cost house,” he said. Malaysian Small Holders Plantation Co-operative secretary Datuk Aliasak Ambia said the move to help estate workers to own houses was a good move. “The co-operative provides houses for estate workers to live in while they are still working, but once they leave their jobs, they will not have any homes of their own,” he said. Township developers are happy that the government is moving to help young adults with income of less than RM3,000 a month to own a home. Prime Minister Datuk Seri Najib Razak said yesterday the government will introduce a scheme via Cagamas Bhd, which will provide a 10 per cent guarantee down payment for houses below RM220,000. This scheme is for first-time house buyers. It allows them to own a home without having to pay the 10 per cent downpayment. Najib said first-time house buyers purchasing homes under RM350,000 will be given a stamp duty exemption of 50 per cent. Mah Sing Group Bhd group managing director Tan Sri Leong Hoy Kum applauded the move as it will reduce the cost of buying a home by as much as RM3,000. Leong said it would directly and indirectly benefit the buyers of several of Mah Sing's projects, where the properties are priced below the RM350,000 range. Mah Sing has double-storey homes in Bayu Sekamat, Hulu Langat, priced from RM240,000, and residential suites in Garden Plaza, Cyberjaya, priced from RM108,000. To facilitate civil servants in owning houses, the government is raising the maximum loan eligibility to RM450,000 compared with RM360,000 currently, effective January 1 2011. Glomac Bhd group executive vice-chairman Datuk Richard Fong said this will allow civil servants to own more expensive homes. Fong said he expects the company's townships, especially Bandar Saujana Utama in Sg Buloh, to sell better. "It is very encouraging for the property sector, for the civil servants and first time house buyers. While developers like Glomac will benefit, it will encourage more people to come forward and buy homes instead of shying away," he said. 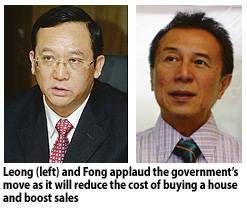 Fong also said the government's move will be a big boost for properties priced below RM300,000. Selangor Dredging Bhd’s latest offering is a small development comprising 38 units on slightly more than an acre. Located off Jalan Ampang, the developer will be tearing down the bungalow and building two interlocking L-shaped blocks of 10-storey condominium in its place. Managing director Teh Lip Kim says unlike a high-rise condominium project where its main selling point will be the view, the main selling point for Dedaun is its location and overall design and concept. There is a restriction on height in that location and the maximum for that site is 10-storeys. The living area and master bedroom (below pic) with its floor to ceiling sliding glass doors can be opened to create a “balcony” effect. “Although one is living in the city, there will not be that busy hustle and bustle feel once one turns into the slip road that leads into Dedaun. There will be a certain elegance about the place, a quiet serenity although it is just a short walk away from Jalan Ampang,” she says of the niche development. The project will have a lush green perimeter around it, hence the name Dedaun (the leaf). The project will have a gym, a function room with pantry facilities, a rooftop swimming pool on one of the blocks and a children’s wading pool. There will be three garden units with private gardens and three penthouses with their own swimming pools. There will be two units per floor. In line with the overall 1970s era that she is trying to portray, Teh is using materials and techniques that will give the place that certain bygone era look. 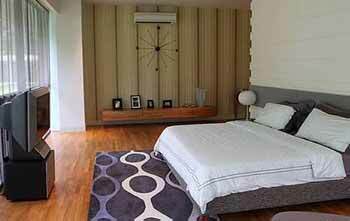 Teh says she was inspired by the family’s home when she was conceptualising the place. There is the hand-crafted copper front door to create that entrance statement in the foyer or what she calls the waiting area. Each unit will have its own private lift lobby. There was a time when metal doors were used, she says. In the old houses, there was a lot of cross ventilation and she has made that an important feature in Dedaun. There are a lot of floor to ceiling sliding doors and windows in both the rooms and the living area. There is therefore a lot of natural lighting and airiness about the place. Space is a premium and Teh has created an aura of space with the open concept with living room flowing seamlessly into the dining and dry kitchen area. “It is an elegant residential area and despite the changes that have taken place, it will continue to be an upscale area to live in,” Teh says. Selangor Dredging is one of several developers who have targeted that part of Kuala Lumpur for their niche developments currently. Other developers who are building in that area include Singapore’s CapitaLand group, Gamuda group, Nam Fatt Bhd and Tan Sri Yap Yong Seong, popularly known as Duta Yap who has gone into a joint venture with a South Korean partner. There is also another Singaporean developer who is building their project there. 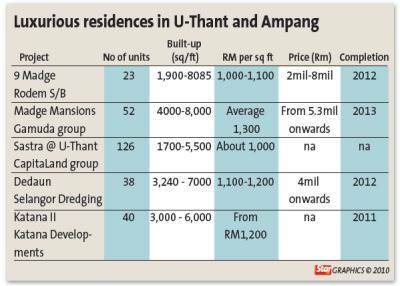 Among the current on-going projects within the same pricing category as Selangor Dredging’s Dedaun, which is selling for about RM1,000 per sq ft, the largest development is probably CapitaLand’s Sastera@U-Thant with more than 100 units over 1.77 acres. Other projects by Selangor Dredging includes Park Seven around the KLCC area, AmanSari in Puchong Kinrara, 20trees in the Melawati area and Five Stones in SS2. PJ. The real estate market across the region, including Malaysia, is still in the limelight and has shown it has the ability to change the course of things for the economy. Whether we like it or not, property can wield quite a lot of power in the way a country’s economy moves. How the economy turns out – for better or worse – depends on whether market players, property buyers and the relevant authorities have acted responsibly and watched over its welfare. The latest concern is that the property market in the region is heating up. China, Hong Kong and Singapore have implemented policy measures to cool their overheating property markets. Malaysia may follow suit if the rise in property prices widens from the landed housing sector in the Klang Valley and Penang to the other parts of the country. Undoubtedly, a healthy and sustainable property market will benefit the whole economy as it promotes stronger property values, higher employment and tax revenue, and substantial spill over benefits to the other economic sectors. As such, it is important to ensure the local property market continues to grow and be a productive contributor to the country’s economy. To achieve that, it is important that the right practices and measures are in place. Getting the basics right is important. And all stakeholders – whether they are property buyers, developers, the regulatory authorities – has a responsibility to ensure the market behaves in a balanced and sustainable manner. As long as we need a roof over our heads and need to buy or sell property, we are all stakeholders in the property market. Usually a laissez-faire or free market economy is a function of demand and supply. Keeping the market balanced is the best way to go but there are various factors that will affect its balance. The important attributes for a healthy property market include quality product offerings; ensuring supply matches demand and there is no mismatch in product types; constant flow of products to meet demand; and a healthy financing market. At the fundamental level, the basic tenet for a balanced market is that supply should equal demand. As the rise in property demand and prices is most visible in Kuala Lumpur and some other parts of the Klang Valley and Penang, the supply line for these markets should keep up with the strong demand. Developers with projects in the pipeline should look into “fast track” development models to churn out more timely products for the market. Meanwhile, quality should also be emphasised as buyers are more selective these days and do not mind paying more for well-designed projects. In fact, the less hassle for them the better. That explains why more higher priced projects are in hot demand because buyers don’t mind paying for products that use high quality materials and are renovation-free. After all, well-designed and wholesome housing estates is one of the basic foundations for healthy families and societies to develop. In keeping with that, sustainable development should be given more emphasis. If possible uniform standards should be introduced to ensure industry practitioners and the public will more readily embrace green and sustainable development practices and way of life. Although there is a growing number of property buyers who may be opting for higher priced properties these days, not everybody is able to keep up with the rising prices. Pro-active measures should be taken to promote home ownership among these people. I believe one of the most effective measures is to have a dedicated national housing board to plan and develop good public housing estates in various parts of the country that have different designs, built-up and price range to cater to the different affordable levels and needs of these buyers. With rising prices of many goods and services, many Malaysians are finding it hard to make ends meet. They are not just the labourers and bottom ranking workers but include fresh graduates, newly married couples, and middle ranking executives. Instead of building high-density low-cost housing projects, it is better to plan for more medium-priced housing of between RM100,000 to less than RM300,000. The projects should be in reasonably good and decent locations that have good basic amenities, accessibility and infrastructures. These projects should be given priority and open to all eligible Malaysians who are first time home buyers. First-time house buyers should be allowed to continue to borrow up to 90% of the property value or even 100% depending on the situation. Ensuring accessibility to loan financing to those who really need them to own their dream home will be a boon to the home ownership campaign. 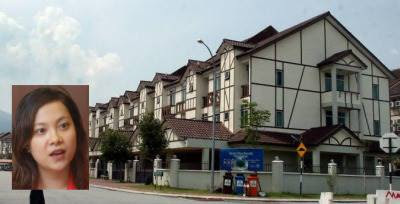 Under Budget 2011, the Government’s proposal to introduce a First Home Scheme with Cagamas Bhd providing a guarantee on the 10% down-payment for houses priced below RM220,000 is a step in the right direction. The scheme will allow first-time house buyers with monthly household income of less than RM3,000 to obtain a 100% loan. Deputy news editor Angie Ng hopes all stakeholders, including developers, property buyers and the authorities, will give more importance to the sustainable cause. Developer and resort operator Karambunai Corp Bhd will build an integrated eco-tourism resort (IR) in Kota Kinabalu, Sabah, for over RM3 billion. In unveiling the 2011 Budget yesterday, Prime Minister Datuk Seri Najib Tun Razak said the government will allocate RM100 million to part-finance the development. Najib said the project will start next year. The IR project is now under planning and it will take about five years to complete. It is learnt that the project, which may look like Singapore's Marina Bay Sands, will be developed over 200ha of land in the Karambunai peninsula. Karambunai Corp has 600ha of land in the Karambunai peninsula. 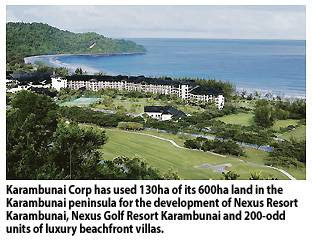 It has since 1997 used about 130ha to build the five-star Nexus Resort Karambunai, Nexus Golf Resort Karambunai and 200-odd units of luxury beachfront villas. Company sources said the IR project will have four- and five-star hotels and resorts, waterfront properties and an entertainment centre. It may also include a museum, cultural villages, a cable car and a theme park similar to the famed Disneyland. "We have the support of the state-government, which is very pro-active in eco-tourism projects in Sabah. International experts will be roped in for the IR project to ensure that it attracts locals and foreigners, targeting a boost in tourism," one source said. Sabah-based Karambunai Corp is linked to NagaCorp Ltd, which is listed in Hong Kong and operates a casino in Cambodia. The two companies' common shareholder is Tan Sri Dr Chen Lip Keong, who founded NagaCorp and serves as its chief executive officer. Chen is president of Karambunai Corp. The Government will allocate RM850 million for infrastructure support to accelerate corridor and regional development in the country. Prime Minister Datuk Seri Najib Razak, in his Budget 2011 speech, said the focus will be on several clusters with specialisation and geographical advantages. Iskandar Malaysia will get RM339 million for the construction of highways, development of housing areas as well as providing and improving public transportation services. Najib said the amount of investment committed by the private sector in the southern Johor region was RM62 billion as at June 2010, surpassing the targeted RM47 billion. Total actual investment in the same period was RM25 billion. The Northern Corridor Economic Region will get RM133 million, which includes the development of an agricultural products processing centre, tourism infrastructure and a biotechnology incubator centre. For the East Coast Economic Region, RM178 million is set aside for projects including industrial parks, water treatment plants, development of tourist areas as well as redevelopment of former Pahang Tenggara Development Authority and Jengka Region Development Authority areas. Sarawak Corridor of Renewable Energy will receive RM93 million for facilities including telecommunication, water supplies, airport and roads as well as halal food industrial parks. For the Sabah Development Corridor, a sum of RM110 million is allocated, among others, for palm oil industry cluster projects, agro-industrial precinct and integrated farming centre. Pemodalan Nasional Bhd plans to build a 100-storey tower which is due to be completed in 2015; the Petronas Twin Towers is 88-storey high. Pemodalan Nasional Bhd's plan to build Malaysia's tallest tower on a 7.2ha area in the vicinity of Stadium Merdeka and Stadium Negara was met with mixed reaction from property experts. Prime Minister Datuk Seri Najib Razak yesterday announced in his budget speech of PNB's plans to spend RM5 billion on an integrated development by 2020. The development includes a 100-storey tower which is due to be completed in 2015. The Petronas Twin Towers is 88-storey high. One property consultant, who declined to be named, said the developer of the tower will have to be very resourceful in order to secure tenants for the space. It is understood that the tower alone will have 3.5 million square feet of space. He also said that the RM5 billion price tag justified the amount of infrastructure work that would have to go into the development of the area, which includes roads and tunnels. Zerin Properties chief executive officer Previndran Singhe, as a proponent of iconic structures, is all for the project. "I've always maintained that an iconic structure doesn't have to be a tall one, but we need iconic structures to give the country a sense of identity. "Just like how when you think Paris, you think Eiffel Tower," he said. Previndran said with the government's various initiatives like Kuala Lumpur International Financial District and announcement of three brokerage licences, there was a high probability that there would be a need for the space come 2015. "Also, we don't know what the composition would be like. It could be 80 per cent office space and 20 per cent hotel space, it's all subject to demand and supply," he said. A 100-storey building on average would cost 50 per cent more per square foot than a normal high-rise building, depending on the actual design. PETALING JAYA: The Government has earmarked several multi-billion projects that will see the construction of several highways, a mass rapid transit (MRT) system, and the Kuala Lumpur International Financial District (KLIFD) amongst others, to be kicked off next year. Generally, the planned development is well-received by the construction sector. Prime Minister Datuk Seri Najib Tun Razak yesterday said in the Budget 2011 speech that under the public-private partnership (PPP) initiatives, several projects under the 10th Malaysia Plan would be implemented next year through private investment of RM12.5bil. The Government had allocated RM1bil from the facilitation fund. Among the PPP projects mentioned are the construction of several highways and 300-megawatt combined-cycle gas power plant in Kimanis, Sabah. Others are the International Islamic University Malaysia Teaching Hospital, the Women and Children’s Hospital, Integrated Health Research Institute Complex in Kuala Lumpur and Academic Medical Centre. Additionally, high-impact strategic developments were also identified. The first is RM26bil KLIFD where the Government is prepared to consider special incentive packages to attract investors to the KLIFD. Next, is the MRT in Greater KL with an estimated private investment of RM40bil which is expected to be completed by 2020. Also, the mixed-development of the Malaysian Rubber Board (MRB) land in Sungai Buloh to be undertaken by the Employees Provident Fund (EPF). 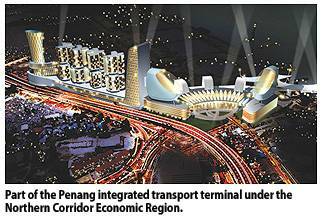 This is to be completed by 2025 and the development is estimated at RM10bil. Finally is the development of another landmark building, a RM5bil 100-storey tower, Warisan Merdeka to be developed by Permodalan Nasional to be completed by 2020. Master Builders Association of Malaysia (MBAM) was appreciative that the Government would focus on many construction projects under Budget 2011. Its president Kwan Foh Kwai hoped the Government would ensure the speedy award and efficient implementation of high impact projects. “Any delay in implementation, will mean additional costs to the project,” he said in a statement yesterday. Additionally, StarBizWeek also contacted Kwan to ask on possible shortage of construction capacity such as professional and labour workforce as well as raw materials due to the implementation of the mega-size projects. “Because most of the projects are spanned across 10 years on average, we do not expect to experience any shortage on professionals such as engineers and architects as well as raw materials. “The current demand of raw materials are also within the capacity of suppliers,” he said. But, Kwan was a little bit concern on labour workforce as the industry now was over-reliant on foreign workers. “That is why MBAM supports the initiative to reshape the economy through a focus on intensifying human capital development, vocational training and improving lifelong education that will help improve the labour force in Malaysia,” he said. Meanwhile, EPF chief economist Norashikin Abdul Hamid said the development of MRB land by EPF was expected to boost the economy and the construction sector in particular. “The Government’s decision in selecting EPF to enter into a joint-venture with the Federal Government to develop the land has been weighed and deliberated carefully, given EPF’s strong financial position,” she said. UEM Land Bhd director of finance, corporate affairs and investment Mohd Zakir Omar supported the PPP concept and the company had been pursuing to the Government a number of projects in the past few years involving property development. KUALA LUMPUR: The government made good its commitment to forge ahead with major infrastructure, construction, and oil and gas-related projects under the Tenth Malaysia Plan when the Budget 2011 proposals were unveiled on Friday, Oct 15. Among them are the Mass Rapid Transit (MRT) in Greater KL; a 100-storey skyscraper in the heart of Kuala Lumpur and a regasification project in Malacca. These projects would be a boon to infrastructure and construction players, as well as those providing oil and gas support services, fabricators and those specialising in pipe-coating services. For the MRT project to be implemented next year, the estimated private sector investment is to the tune of RM40 billion. The project is envisaged to be completed by the year 2020 and is expected to increase utilisation of public transportation by at least 40%. Permodalan Nasional Bhd will undertake development of the integrated Warisan Merdeka, including a 100-storey skyscraper that would be the tallest building in the country, at a cost of RM5 billion. The tower will be completed in 2015, and the project would retain the Merdeka Stadium and Stadium Negara as national heritage sites. Another mammoth project is the RM10 billion Sungai Buloh project at the current Malaysian Rubber Board land covering an area of 2,680 acres. The Employees Provident Fund will develop this project. As the oil and gas, and energy sectors remain among the major contributors towards the national economy, the government has pledged RM146 million to support the sector and expand downstream activities. Towards this, the government proposed an oilfield services and equipment centre in Johor that will be built at a cost of RM6 billion via private investment. Also, Petroliam Nasional Bhd would undertake a proposed RM3 billion regasification project in Malacca, to be operational by 2012.